Collections by Weiser offers five handlesets to choose from. These handlesets offer solid forged brass construction and Grade 1 cylinders for uncompromised security. The bold form and clean, geometric shape of the Vedani lever reflect a contemporary aesthetic. This half-dummy, or trim function, is surface mounted on doors where only a pull is required. The Polished Chrome is perfect for coordinating in a bathroom with polished chrome fixtures. Our finest line of door hardware ever: Collections by Weiser. Weve taken 100 years of experience and crafted our most distinctive line of products, in the latest styles and finishes, with the highest level of security that you can count on for your home. Weiser<sup></sup> locks are the perfect addition to any door, creating a stylish and elegant impression. Available in a variety of Decorator Finishes and styles, you are sure to find one that meets your unique style and taste. The Elements Series<sup></sup> provides an expanded choice in Fashion Doorware at an affordable price. In decorating your home, choosing the right paint, wallpaper, tile and trim is important in creating a personal design. The Elements Series of Fashion Doorware will support and enhance your decorating decisions. A clean, streamlined design on the Kim fits a wide range of decorating styles: from traditional and ranch to contemporary. This half-dummy, or trim function, is surface mounted on doors where only a pull is required. The Satin Chrome finish gives the product a modern and minimalist look. 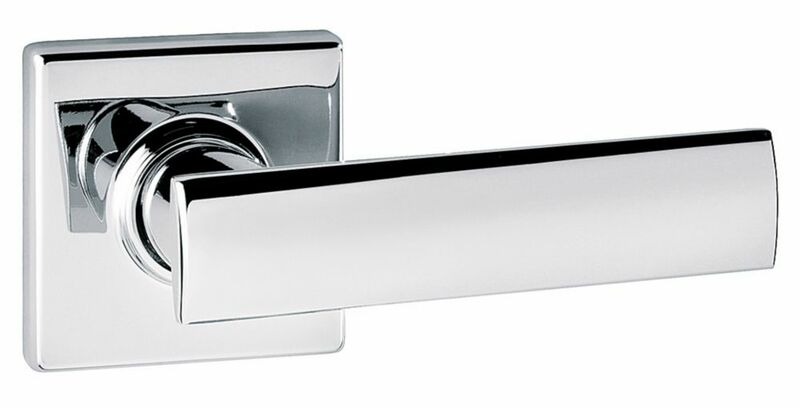 Vedani Dummy Lever in Polished Chrome Collections by Weiser offers five handlesets to choose from. These handlesets offer solid forged brass construction and Grade 1 cylinders for uncompromised security. The bold form and clean, geometric shape of the Vedani lever reflect a contemporary aesthetic. This half-dummy, or trim function, is surface mounted on doors where only a pull is required. The Polished Chrome is perfect for coordinating in a bathroom with polished chrome fixtures.